When Randy is in high school, he applies to Brown University and doesn’t get in, but is instead placed on the wait list. Randy continually calls the admissions office until eventually they decide that “they might as well accept” him. Tenacity got Randy over that brick wall. Randy uses the obstacle of being put on the waitlist as an opportunity to show how badly he wants to get in by calling Brown every day. Randy’s proactive positive behavior earns him admission to the university. When Randy graduated from college, it never occurred to him to go to graduate school until Andy Van Dam, Randy’s mentor, told him to get a PhD and become a professor. Randy asks why, and Andy tells him that Randy is a good salesman and any company will use him as such, so he might as well sell something worthwhile “like education.” So, Randy applies to Carnegie Mellon at Andy’s urging, and promptly gets rejected despite a letter of recommendation from Andy. Randy tells Andy, who wants to call the head of admissions at Carnegie Mellon, but Randy stops him, saying he doesn’t want to be accepted that way. They strike a deal that Randy can look at other programs, but if he doesn’t find another fit, he’ll let Andy make a call. Randy listens to his teacher and mentor Andy van Dam, takes in his feedback, and decides to apply to grad school. However, this time when he runs up against a brick wall of being flat-out rejected, Randy refuses to accept Andy’s help in making a personal call to have his application reconsidered. In this case, Randy—at least temporarily—fails at treating this obstacle as an opportunity. Randy tells Andy Van Dam he’s decided to skip grad school and get a job, but Andy refuses to let him do that, instead calling Nico Habermann, the head of Carnegie Mellon’s computer science department, to inform him of Randy’s credentials. Randy visits Nico’s office the next morning, and Nico asks why they should reconsider Randy’s application. Randy replies that he won a fellowship from the Office of Naval Research, and, though Nico gets frustrated and says that money isn’t part of Carnegie Mellon’s admissions criteria, Randy apologizes, saying he only mentioned it because it was an honor he thought might be relevant. Eventually, Randy is accepted to Carnegie Mellon, and, until his last lecture, Randy had never told another person that he was initially rejected. Randy regrets having waited that long to tell the story, because “the moral is: If you want something bad enough, never give up (and take a boost when offered).” Brick walls are indeed there for a reason, even if someone else has to throw you over them. Randy was worried for many years that accepting Andy van Dam’s help in getting admitted to Carnegie Mellon was an entitlement rather than something he earned. What he realizes now is that being humble enough to accept other people’s help is what earned him the right to make his case for why he should be accepted. All this time later, after having returned to Carnegie Mellon as a tenured professor and having so much success there, Randy believes he should hold this story up as the ultimate example of how he turned an obstacle into an opportunity by taking a mentor’s help and advice. Koltun, Moe. "The Last Lecture Chapter 53: Never Give Up." LitCharts. LitCharts LLC, 26 Feb 2017. Web. 24 Apr 2019. Koltun, Moe. "The Last Lecture Chapter 53: Never Give Up." LitCharts LLC, February 26, 2017. 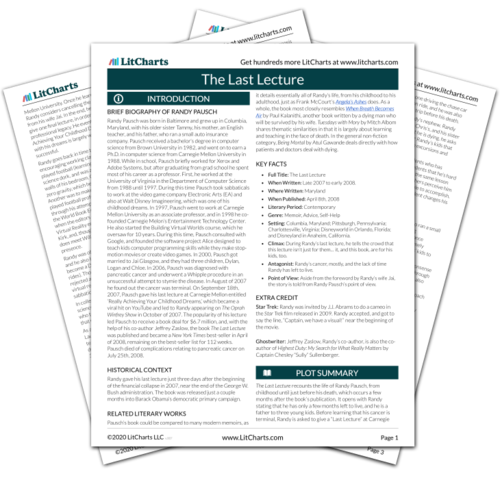 Retrieved April 24, 2019. https://www.litcharts.com/lit/the-last-lecture/chapter-53-never-give-up.